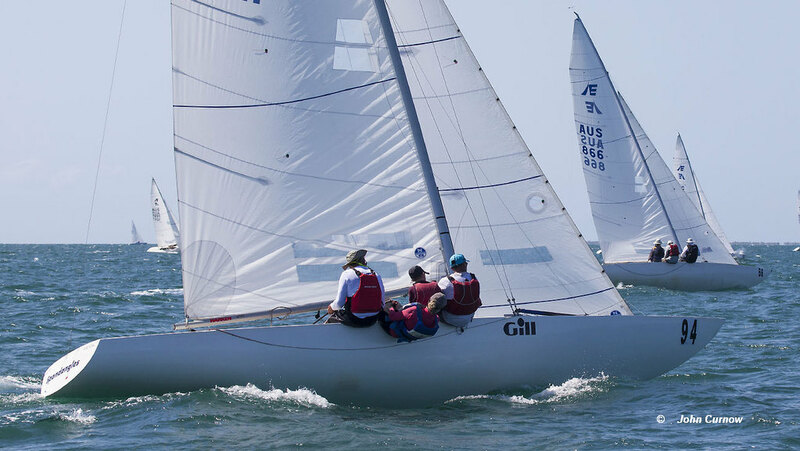 Second day of the 2019 Etchells Australian Championship and after five races completed Gen XY of Matthew Chew, Brian Donovan, Ben Vercoe and Mitchell Kennedy takes a one point lead. Chew leads by one point from Havoc of Iain Murray, Colin Beashel and Richard Allanson, with Martin Hill, Julian Plante, Mat Belcher and Sean O’Rourke in third place. Winner of the first race of the day (R4) was Triad of Kirwan Robb, who moves into fourth place overall. Secons was Mark Bradford’s Log and in third place Iain Murray’s Havoc. Matthew Chew took the second race ahead of Graeme Taylor’s Magpie, with Havoc of Iain Murray in third place. There are two final races scheduled to complete the championship.